Some clouds this morning will give way to generally sunny skies for the afternoon. High 67F. Winds light and variable..
A Peachwave Self Serve Frozen Yogurt dish is topped with raspberries, nuts and candy at the Lakeport Commons shop. Manager Megha Gupta, left, and Nischal Gor show off a dessert created at Peachwave Self-Serve Frozen Yogurt, a new shop at Lakeport Commons in Sioux City. Some of the 14 yogurt flavors can be seen in the background. Toppings are offered at the left. Customer Tyler Lupkes tries a few of the fruit topping options at Peachwave Self Serve Frozen Yogurt at Lakeport Commons. 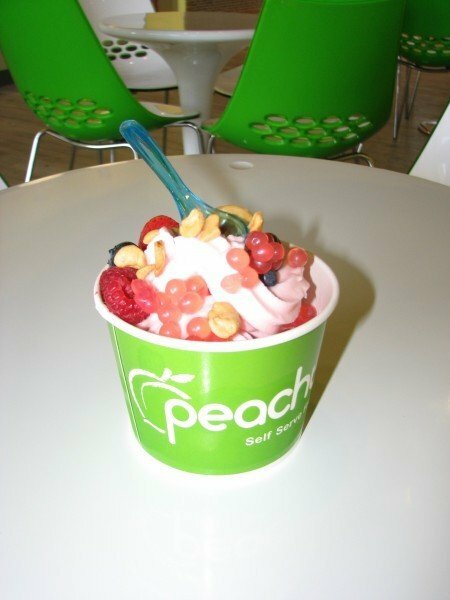 Fresh fruit options are part of the 42 toppings available at Peachwave Self Serve Frozen Yogurt. SIOUX CITY -- Tenth-grader Megha Gupta has done the math. She's crazy about math. According to her calculations, there are at least 5,800 flavor combinations possible for dessert lovers to create at Peachwave Self-Serve Frozen Yogurt at Lakeport Commons. 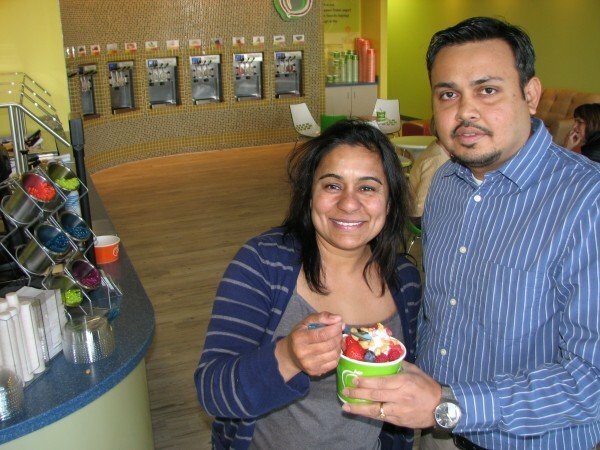 "We like to say the combinations are infinite," said Gupta's mother, Hemlata Gupta, manager at Peachwave. At any given time, there are 14 flavors of yogurt available at the self-serve dessert shop that opened Nov. 1. In addition, some 42 toppings stand at the ready. They range from fresh fruit to chocolate candy to nuts and cereal. There's also sauces like hot fudge, peanut butter and whipped cream to top off whatever you create. "We're trying to promote healthy dessert in a fun way," said Nischal Gor, the franchise licensee who operates both the Sioux City and Sioux Falls locations. "We are from Sioux City, but we actually opened the Sioux Falls site in June," Gor said. "Sioux City is the first Iowa site." Nationwide, the Oklahoma-based franchise boasts 34 Peachwave establishments. Customers are asked to follow four quick steps in creating their yogurt dish. They grab a cup and then step up to any flavor they wish and dispense as much as they'd like into an empty cup or a cup lined with a waffle cone. Then, they sashay to the toppings and repeat, topping the dish any way they see fit. To pay, they place their creations on a scale. Some dishes cost as little as $1. April Schomberg of Sioux City stopped in Monday afternoon. She created a Cheesecake Yogurt dish with fresh strawberries, cookie dough, granola and Graham crackers. "I've never had anything like this," she said. "This goes above and beyond." Schomberg said Peachwave's unique yogurt setup has created a buzz in and around Sioux City. Gor would agree, having served 600 dessert lovers on Saturday alone. Yogurt flavors are also offered in non-fat, sugar free and lactose free options. "I think it's a guilt-free dessert as you can get fresh fruit and non-fat yogurt," said Gor, who struck a deal with his 4-year-old son. "I tell him that he can have lots of yogurt as long as he has lots of fresh fruit." Peachwave, according to Gor, will help fill a tasty niche in Sioux City, a city he sees as pretty health-conscious. Gor noted seeing people working out frequently at businesses like the Siouxland Y and Four Seasons. "People are health conscious," he said. "Research has shown that yogurt has health benefits. We think for many people our place (Peachwave) will become a destination." Where: Lakeport Commons, next to Buffalo Wild Wings. Hours: 11 a.m. to 9:30 p.m. Sunday through Thursday and 11 a.m. to 10 p.m. Friday and Saturday.